Table tennis is a special sport. You can win this game by doing the illegal serve. By knowing the top 5 most common illegal service in table tennis, you can ask the opponent to stop doing these serves. First, we will talk about what is a legal serve. Then the most used illegal serve in table tennis to know and avoid. Have you known the 6 basic table service rules? Or why Chinese player prefer serving short with much side spin? If not, you should also read about this table tennis tricky serve “Ghost serve”! Very interesting! How many times that you can do the “let serve” in table tennis? How many times that you can do the “fault serve” in table tennis? How to deal with tricky, unfair service in table tennis? Based on official rules, the ball must rest on an open hand palm. Then it must be tossed up at least 16cm. If the serve touches the net, it is called a let serve (not “net serve”). Let serves are legal but not scored and need to be served again. You must toss the ball upward at least 16cm. (Rule 2.06.02). Some players just quick drop-and-hit, this is an illegal serve. Your toss must be “near vertically upward” (Rule 2.06.02) It’s common to see players throwing the ball backward. But how is “near vertical”? It depends on Referee. You cannot hide the ball with your body or arm during the serve. (Rule 2.06.04 and 2.06.05). You must remove your free arm (and body) so that the receiver has the full view of the ball. Hidden serve in common in table tennis, especially used by the left-hand player. The service must start behind the end line and above the table surface. (Rule 2.06.04). Some players toss with the ball inside the table or strike the ball over the table, which is illegal. You must strike the ball as it is on its way down. (Rule 2.06.02). You can’t hit the ball as it’s on the rise from your toss. You can read the full official service rules in the ITTF Rulebooks. You can do many let serve as you want. 2, 3, 4, 5 or many. In some countries, some players say the rule “If you have 3 let serve in a row, you lose the point”! No! It’s not true! Don’t follow this rule! The official rule said that “There is no limit about the number of let serve in table tennis”. Unlike tennis, that you can make 2 “fault serve” and you lose the point. In table tennis, with only 1 “fault serve”, then you lost the point! What is “fault serve” in table tennis? Faut serve is like, the ball bounce 2 times on your side, or jump outside of the table, or it touches your hand, your body during the service. Read the “serving rule in table tennis” for more. As a coach, I know that tricky serve is ugly, and hard to deal with. If there are not umpire, it would be a big deal for you! So one way to deal with this problem is to learn the “15 code and the Fairplay etiquette in table tennis” here. And share with your teammate or your opponent! These are the unwritten rule, but every player should know to have a Fairplay game! 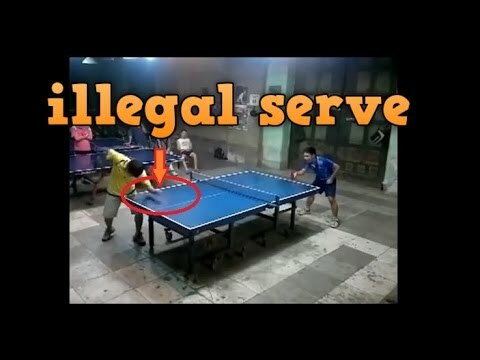 Amateur table tennis players love doing illegal service! Sad but true! Because illegal serve provides many advantages (but dirty): They can win the point directly! Or they will gain the lead in the crucial moment (like in 9-9, or 10-10), or they just do just for fun! Even some professional table tennis players love the tricky serve! Mostly “hidden serve”! Here are the videos that show the illegal service at the amateur level. How do you feel? Comment below to show your opinion! What is an illegal serve in table tennis? There are many types of illegal services: quick serve, hidden serve, low toss serve, back toss serve, over the table serve, or bad-manner services, etc. Let’s resume the 5 most used illegal serve. Hidden serve is the most common illegal serve in table tennis. The player uses his free arm or his body to hide the contact point. It’s difficult to see if this was a topspin serve, a no spin float serve, or a backspin serve. Hidden serve was allowed before but ITTF changed the rule. The best way to counter this illegal serve is asking the player, or the referee to stop hiding the serve. Some players (especially amateur level) don’t throw the ball high enough. They just throw the ball directly to the blade. This makes the unfair advantages for the server: faster ball, and spinner serve. You should complain to the referee or refuse to continue to play if the opponent does this illegal serve. The 3rd illegal serve that many players use during the tournament is “quick serve”. The opponent is not ready, and then they serve quickly (normally the fast one down the line). This is a bad-manner serve. Please wait for the opponent to be in the ready position. If you get this “bad-manner serve”, don’t accept the score, don’t play this ball. Ask the opponent to redo the service. Read the “Table Tennis Etiquette – top 15 Unwritten rules that every player should know”. There is no rule to restrict the time that a player must serve. But some player tried to reduce the pace of the game, or the perturb the opponent by taking too long time to serve. They changed several positions, pick up the ball slowly, and try to delay the match. If you are in this situation, stay calm. Focus on the game. Ask the referee, and win the point. If you do that, the opponent knows that their trick won’t work, and stop doing these stupid illegal serves. The last common illegal serve is in the table serve. The ball is inside the table, which is not legal. This trick will help to make a super short serve. Don’t accept the point, and ask the referee about this case. Ask the server to put the ball outside the table. Have you encountered other examples of “illegal serve” in table tennis? Let me know by commenting below. Let’s play fair! Stop doing the illegal serve, it’s not fun at all. Please learn how to serve effectively in table tennis, rather than doing the tricky illegal serve. Let’s share and rate this article [ratings]. How was the most common one not mentioned, the no where near vertical throw, usually a full meter of Arc. Would you tell me if it is legal to “bounce/hit” the ping pong ball on the ground – once or twice ,as a Tennis Player would ,before he prepares for his or her normal serve . This ”Habit”, was performed by a player. I thought this to be illegal. I can understand a tennis player doing this with a tennis ball – to possibly judge the bounce of a tennis ball. But for a Ping Pong player to do this – with a “non-compressable Ping Pong ball” – sounds to me to be wrong !? I have never seen this being done before in a ping pong match, but I could be wrong. Some players hate this. But bounce the ball on the floor, on the table, on the racket before serving is allowed.